The seven qualification groups have been drawn in Vienna. 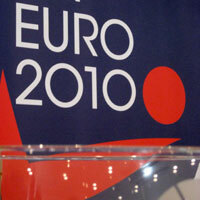 The draw procedure for the EHF EURO 2010 Qualification was carried out on 24 March. The event that took place in the EHF HQ, Vienna, is an important date for the competition that will take place in Denmark and Norway on 7-19 December 2010. The importance of the event was underlined by the presence of the President of the European Handball Federation, Tor Lian; a delegation from Denmark led by the President of the Danish Handball Federation, Per Rasmussen; and the Secretary General of the Norwegian Handball Federation, Per Otto Furuseth. The organising countries, Denmark and Norway are directly qualified for the event, while the teams ranked no. 1 and no. 2 of the seven groups will also qualify for the Final Tournament. The draw carried out on 24 March allocated the teams into seven groups of four. The draw defined the teams of the seven groups and also a basic match schedule. The official website of the Women’s EURO 2010 is available under www.ehf-euro.com/den-nor2010. Find more information on the Qualification, .